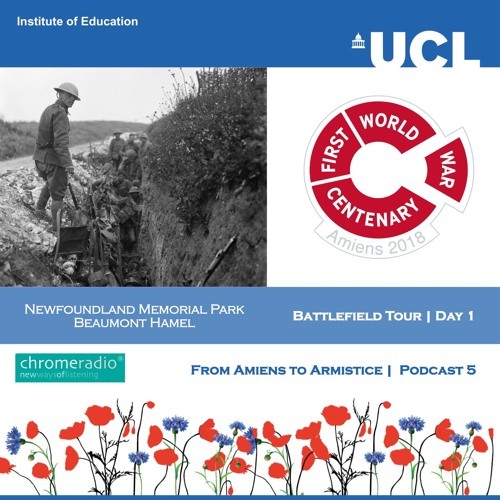 A series of podcasts commissioned by UCL INSTITUTE OF EDUCATION'S FIRST WORLD WAR CENTENARY EDUCATION PROGRAMME to mark the CENTENARY of the BATTLE OF AMIENS on 8 August 1918. In August 2018, students from across the United Kingdom joined students from France, the United States, Canada and Australia on the Western Front to commemorate the Battle of Amiens. This podcast series, recorded mostly during that battlefield tour, tell the story of the Battle of Amiens in the wider context of the First World War and the road to armistice. In this podcast, we join the students on their visit to the NEWFOUNDLAND MEMORIAL PARK at BEAUMONT HAMEL, where they explore the preserved battlefield and trenches, following in the footsteps of the Newfoundland Regiment on the morning of 1 July 1916, the first day of the Battle of the Somme. CONTRIBUTORS | Simon Bendry, Director, First World War Centenary Battlefield Tour Programme, UCL Institute of Education - Sir Hew Strachan, Professor of International Relations, University of St Andrews - Readings by members of the battlefield tour group. IMAGE | The Battle of the Somme, July - November 1916 Royal Engineers No.1 Printing Company. Troops waiting, some still asleep, in a support trench shortly before zero hour, Beaumont Hamel. - http://media.iwm.org.uk/iwm/mediaLib//37/media-37570/large.jpg - Collections of the Imperial War Museums, Public Domain, https://commons.wikimedia.org/w/index.php?curid=30857538. PRODUCTION | ChromeRadio for UCL INSTITUTE OF EDUCATION'S FIRST WORLD WAR CENTENARY EDUCATION PROGRAMME | Executive Producer - Simon Bendry | Producer - Catriona Oliphant | Post-production - Chris Sharp.